Synthetic peptide within Human HNRPAB aa 8-38 (N terminal) conjugated to Keyhole Limpet Haemocyanin (KLH). The exact sequence is proprietary. 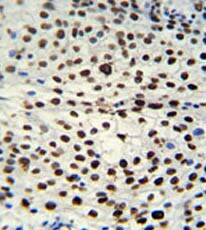 HepG2 cell line lysate; Human cervix carcinoma tissue; MCF7 cells. Our Abpromise guarantee covers the use of ab174971 in the following tested applications. Binds single-stranded RNA. Has a high affinity for G-rich and U-rich regions of hnRNA. Also binds to APOB mRNA transcripts around the RNA editing site. Dimethylation at Arg-322 is probably asymmetric. Immunohistochemical analysis of formalin fixed, paraffin embedded Human cervix carcinoma labeling HNRPAB with ab174971 at 1/50 dilution, followed by peroxidase conjugation of the secondary antibody and DAB staining. Immunofluorescence confocal analysis of MCF7 cells labeling HNRPAB with ab174971 at 1/25 dilution. MCF7 cells were fixed with 4% PFA (20 min), permeabilized with Triton X-100 (0.1%, 10 min), then incubated with ab174971 (1/25, 1 h at 37°C). For secondary antibody, Alexa Fluor® 488 conjugated donkey anti-rabbit antibody (green) was used (1/400, 50 min at 37°C). 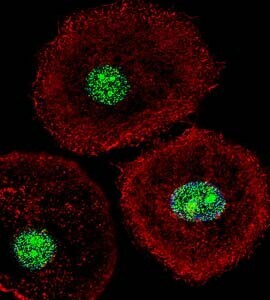 Cytoplasmic actin was counterstained with Alexa Fluor® 555 (red) conjugated Phalloidin (7units/ml, 1 h at 37°C). Nuclei were counterstained with DAPI (blue) (10 µg/ml, 10 min). HNRPAB immunoreactivity is localized to Nucleus significantly. ab174971 has not yet been referenced specifically in any publications. Publishing research using ab174971? Please let us know so that we can cite the reference in this datasheet. There are currently no Customer reviews or Questions for ab174971.